The program spans 6 months for officers and 2 week for clerks. The program for officers consists of classroom training sessions, covering basic aspects of operations, credit and forex, and comprehensive branch rotations which take you to a variety of branches of various types (like Rural/Semi Urban, Urban/Metro, advances-focussed). Apart from taking care of the functional on-boarding of newly hired officers, the bank also carries out a cultural on-boarding exercise, providing various forums for new hires to interact with senior management. The career path policy in the bank ensures a rich variety of exposures in areas like operations, credit, forex, and administration/facilitation for all officers joining the bank. It ensures that over time, all officers are wholesome, holistic bankers. The policy also ensures a growth track for all employees in the bank. Over the next few years, the Bank is poised for aggressive growth in business under its Transformation Process. Bank has put in a place a system which proactively identifies and groom future potential leaders This includes giving them proper exposure in various roles, giving them the right trainings, etc. to assume leadership roles in the future including succession planning for critical positions. Apart from salary, Bank also offers various employee benefits like medical coverage (including walk-in walk-out facility at select centres) for self and dependent family members, LTC / LFC facilities, Holiday Home facility at various centres across the country, concessional staff loans, etc. Further, for officer staff Bank provides residential quarters, wherever available or leased housing accommodation facility. Long service awards recognizing continued service. Bank of Baroda, with a network of 97 branches/offices has the second highest number of international branches among all Indian banks. India Based Officers identified and posted for overseas assignments for tenure of 3 to 5 years. ~20% of Scale IV officers have had an overseas stint. Both older generation as well as Gen-next customers bank with Bank of Baroda. The bank with its wide spread of branches allows you to serve the entire gamut of customer types - from small town farmer to big town corporate. The bank as on 31st December 2012 has 900 Metro, 738 Urban, 1126 Semi-urban and 1370 Rural branches. The bank offers a variety of vertical specializations, like SME, Retail, Mid-Corporate, large Corporate. The bank has created a host of specialised outfits, including Retail Loan factories to take care of Retail credit, SME Loan factories to take care of SME lending, Mid-Corporate branches which cater specifically to Mid-Corporate customers, and CFS branches specifically to take care of Large Corporate customers. 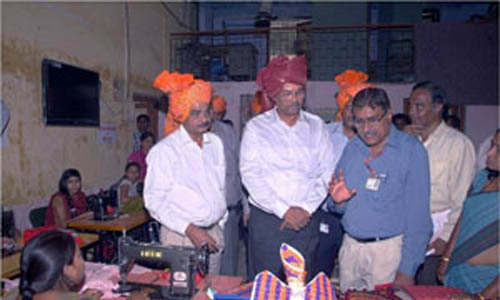 Baroda Swarojgar Vikas Sansthan provides training to unemployed youth in Rural/Semi Urban areas. Baroda Grameen Paramarsh Kendra is a center for knowledge sharing, problem solving, and credit counselling for the rural community. Recognizing the challenges of the future, the Bank has given a boost to sales growth by enhancing customer satisfaction and by making possible alternate channel migration, thus reinventing itself to challenges of the 21st century. All the bank's Metro/Urban branches have been converted to "Baroda-Next" branches, providing a pleasant branch banking experience. The bank has state of the art infrastructure, with modernized Corporate offices; all Zonal and Regional offices linked with video conference facilities. All branches, extension counters, overseas business are linked with the Core Banking Solution, providing seamless networking and communication across the bank's branches and other units. The bank hires from a diverse variety of educational backgrounds. With graduates in science, commerce, engineering and business administration in its workforce, an environment of diversity is created among its employees. You would be recruited as either a clerk, or an officer, depending on your demonstrated ability at the entry level. a pivotal point of contact for customers. The typical role of a clerk is to build long term relationship with customers. He handles basic customer financial queries and services like balance enquiry, pass book printing and payment and receipts of cash. He also handles data entry of customer information and other financial transactions. IBPS from time to time will announce the common written exam for all the 19 Public Sector Banks (PSBs) and IDBI bank. A detailed advertisement regarding the Age, Educational Criteria and other qualifications or criteria required to apply for Common Written Exam (CWE) will be published on www.ibps.in and in leading newspapers. One who aspires to join any of the PSBs has to qualify in the Common Written Exam (CWE), which is specific to the state. Candidates who qualify in Common Written Exam (CWE) will subsequently be called for Common interview which will be coordinated by IBPS. Candidates will also be asked to submit their preference order of banks. Candidates successful in both the written exam and interview will be listed in merit order. Depending on the vacancies in each bank of one’s preference, an offer is made to candidates by the appropriate bank. At present the bank recruits a large portion of its officers through IBPS common written exams. At present the bank recruits a large portion of its officers through IBPS common written exams.A detailed advertisement regarding the Age, Educational Criteria and other qualifications or criteria required to apply for Common Written Exam (CWE) will be published on www.ibps.in and in leading newspapers. One who aspires to join any of the PSBs has to qualify in the Common Written Exam (CWE). Candidates who qualify in Common Written Exam (CWE) will subsequently be called for Common interview which will be coordinated by IBPS. Candidates will also be asked to submit their preference order of banks. Candidates successful in both the written exam and interview will be listed in merit order. Depending on the vacancies in each bank of one’s preference, an offer is made to candidates by the appropriate bank. 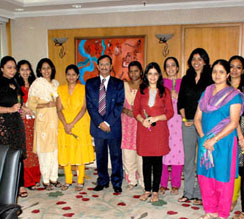 Baroda - Manipal School of Banking has been set up jointly by Bank of Baroda and Manipal group. The school has been set up to first train prospective candidates in Banking and Finance before their embarking on a Banking career with Bank of Baroda. Students are selected through a rigorous selection process and given a systematic training in various areas of Banking and management disciplines in order to make them work ready at the earliest. The bank recruits officers at the lateral levels also, viz. Scale II, Scale III, etc., based on requirements that arise from time to time. Eligibility criteria to apply for these posts depend on the grade/scale for which the recruitment is going on, and will be declared on the website and in leading dailies. 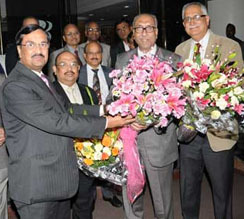 Welcoming of Shri S S Mundra, Chairman and Managing Director by Executive Directors on his taking over charge of Bank. First Staff address by Shri S S Mundra, Chairman and Managing Director on his taking over charge of Bank. 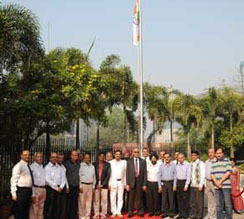 Shri S S Mundra, Chairman and Managing Director and Shri S K Jain, Executive Director accompanied by other Executives during the Republic Day Celebrations at Baroda Corporate Centre. The bank has a wide reach in rural India, with various schemes in place for inclusive development. With the Ultra Small Branch concept, the bank reaches out to 2870 villages, providing banking services to the needy. The Bank has always held inclusive growth high on its agenda. Bank has established 36 Baroda Swarojgar Vikas Sansthan for imparting training to unemployed youth free of cost. This provides self employment & entrepreneurship skill development. It has also set up 52 Baroda Gramin Paramarsh Kendras and for knowledge sharing, problem solving and credit counseling for rural masses across the country. 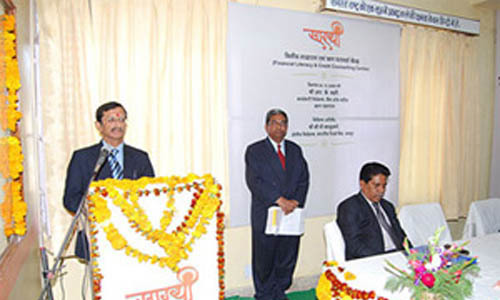 The bank has established 18 Financial Literacy and Credit Counseling Centres (FLCC) in order to spread awareness among the rural masses on various financial and banking services and to speed up the process of Financial Inclusion. At Bank of Baroda, you are provided a range of challenging assignments in various capacities throughout your tenure. A culture of sharing, collaboration, openness, and autonomy will inspire you to deliver your best. You are offered the opportunity to develop into entrepreneurial managers and business leaders. Read about the success stories of employees in the Bank in the "Meet Barodians" section. Bank of Baroda was my foray into the world of banking and Finance after a five-year long experience in the field of Training. Although the transition was marked with anxiety, the support and guidance of my seniors and the suitable training given by the Bank made this transition very easy. The environment here is very conducive and people across the bank, even in higher management are approachable and helpful. I have now spent 2 years with Bank of Baroda, and the kind of exposure I have received has been phenomenal. It has helped me mould myself into a well-rounded professional. During this period I have only seen growth in my capabilities. I have been given exposure and responsibilities that maybe no other bank would have given me. Working here has been interesting and challenging at the same time and has helped bring out the best in me. I enjoy being a part of this Bank that has continued to grow and expand its reach. 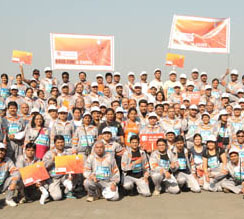 Employees at Bank of Baroda are rewarded for a job well done and know their hard work is appreciated; this makes for a very positive and productive work place. I've also enjoyed being able to delight our customers by increasing their satisfaction levels and also enhance our business. Working here has been a pleasure and I look forward to spending many more glorious years of my career with Bank of Baroda. If you are willing to put yourself out there and learn new things, the opportunities are great. I joined the bank as an MBA Graduate from Vishveshwaraya Institute of technology, Belgaum. Upon joining, I was posted in Chennai Metro Region, Ambattur Branch, a 55 Year old Branch, where I handled the Credit Department with advance portfolio of Rs.55 Crores for 2 years. Subsequently, I had 6 months experience as Joint Manager in Panambur Branch, Mangalore and am presently Branch Manager of a new Branch in Mangalore. The bank has given me the ability to develop my personality, and my position commands respect from society. I also feel privileged to have received an opportunity to take responsibility of an entire branch just two and a half years into the bank. I completed my academics with a Post graduation in computer application. Thereafter, I got employed in a software company and worked in an e-Governance Project. Subsequently, I got an opportunity to work in a PSU Bank where I worked in the IT department, managing and supporting various projects in different departments. This academic background and experience launched me into a career at Bank of Baroda. 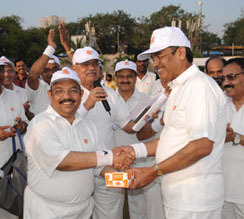 I have been associated with Bank of Baroda for the last 2 and half years. Since my joining, I have been involved with the CBS implementation project of Regional Rural Banks sponsored by the Bank. This project has given me complete exposure of all the Core Banking and alternate delivery channel implementation from scratch. As it was implemented in the remote rural areas, the challenges were even more. The opportunity provided has evolved me as a Project Manager and honed the skills not only on the technical side but also on the administrative side. It has been a great journey thus far. My proudest moment has been when our team completed the CBS rollout of more than 1200 branches in a record 5 months time. I hope to chart out more such proud moments in the future. I was schooled at Scindia School, Gwalior and graduated with Statistics (Hons.) from Patna College, Patna University, Bihar. My decision to join the bank as a Directly Recruited Officer just after my graduation in October, 1989 was motivated by the International presence of the Bank which I thought may bring opportunities in the future. On joining the Bank at Meerut I was posted at Ameria a rural branch in Pilibhit District of U.P., which was initially a complete shocker. It was hard decision on my part whether to proceed ahead to join my new place of posting or return back home. However, my senior colleagues explained the benefits of being posted at a rural branch in the initial years of my career. I was fortunate for that experience early in my service as I got first-hand experience of rural India and could realize the challenges being faced by the vast majority of Indians. This motivated me to serve this section of society with full dedication. I was subsequently posted in Pilibhit, Bhagalpur and then at Patna. At Patna I got the lucky break of being trained as a FOREX dealer when the Bank selected me for undergoing BOURSE training in the year 1997 and in July, 1998 I was posted at our International Business Branch, Kolkata as a forex dealer. This was a proud moment for me being one of the first officers from my state to be selected as a forex dealer by the Bank. After serving out this tenure I was posted as Manager (Planning) in Regional Office, Kolkata Metro Region and that provided me a broader vision of branch and Regional level functioning. I was also given the added responsibility of marketing of Bank’s retail products and setting up of ATM infrastructure in Kolkata. These were new concepts coming into the India Public Sector banks and were very challenging. In the year 2004 I was elevated as a Senior Manager and in May 2005 was posted at Zonal Inspection Centre, Kolkata as Sr. Manager (Inspection). This provided me deep knowledge of branch operations particularly related to operations vis-à-vis the compliance of Bank’s various guidelines. I loved this role as I could act as a friend, philosopher and guide to branches and help them in improving their functioning. Subsequently,I was fortunate to realize my dream for being selected for overseas posting when bank selected me as a Branch Head for our yet to be opened branch at Kenton, London, U.K. I was proud to be the first Branch Head of a branch in London. During my tenure, the branch performed superbly and remained the fastest growing branch of the bank in the whole of U.K. and by the time I was repatriated back to India on completion of my tenure the branch became the 3rd biggest in terms of total business and profit surging past more than 40 years old branches like Southall and Manchester. On repatriation I have again been given the job to open a new SME Loan factory at Gorakhpur, U.P. where I am presently posted. Overall, I have been given an all-round view of the whole gamut of Banking operations, making me a complete banker ready to deal with future challenges. I belong to a lower middle class family where I could enjoy only basic necessities. In view of the struggling life of my parents, I hardly ever thought of luxuries which my friends were enjoying. My parents utilized all their resources on my education rather than keeping their hard earned money for their old age. It was their strong belief that children are the future of their parents and parents, placing full trust in me to take care of them. I joined the bank in 1991 as a clerk immediately after completing my B.Ed. degree. This was a dream job for me, as I foresaw immense opportunities for career progression. After joining the bank, it was my endeavor to add professional qualifications along with getting various skills while working in bank. I completed my CAIIB during my clerical cadre and joined MBA (Banking & Finance) through correspondence study. I got promoted to the Officer cadre in 2000. During my inter-zonal transfer I got opportunity to work in a rural branch for about four years. It was a new experience for me to work in a rural branch. There were about 22 villages under service area of our branch and I had to visit each and every village for assessing their needs. It was a golden period of my life and for my family, memories of which are ever alive in our minds. During my rural posting I got promoted to Scale II. After completion of my inter-zonal posting, I was re-transferred to a metro branch in my home region. Working here was totally different from working at a rural branch. I got comprehensive grooming in Credit and was assigned the credit portfolio of branch in addition to being in-charge of money plex. I worked there for 3 years and got transferred to Chandigarh, where I handled a large credit portfolio successfully. Upon promotion to Scale-III and was posted as Processing Head in newly opened SME Loan Factory (SMELF) in Chandigarh. During my posting in the SMELF, I got overseas placement in Fiji. This was an immensely proud moment for me. Working in overseas territory is an all together different experience and I am of the opinion that one must have this experience during his/her life. It is challenging to work in a new country under different regulations, and where most decisions such as determination of fees & charges, Rate of Interests on deposit/advances/inter-branch, investment of surplus funds, payment of income tax, recruitment of local staff, negotiation of salary of local staff etc are taken at Territory level. Here I witnessed and became a part of various processes of running a territory. During my overseas posting, I got promotion to Scale-IV. The whole of my journey, from clerical to executive cadre has been joyful and satisfying; I have been exposed to different roles, challenges and tasks. The bank has helped me to achieve my career progression to executive cadre, and given me and my family respectable and financially sound status in the society. I am in a position to give my family better amenities and a better education to my children. I owe my position and status today to my Bank, and for this, I am immensely thankful. I had worked as Medical Representative for a short span of 8 months and then in Customs & Central Excise Dept for about 3 years before joining the Bank. Both the assignments were not to my liking so the moment I got an opportunity to work in banking industry I grabbed it and joined Bank of Baroda in 1985. The journey in the Bank has been fantastic and satisfying beyond imagination. My first posting was in rural branch at Jagatpur, Raebareli, which put me in touch with real India- the rural India. I still have vivid memories about the difficult conditions in which our rural people live and how much needed to be done for them in terms of providing financial support for their business & personal needs. Thereafter I got an opportunity to work in Capital Market branch, where I handled nearly 25 IPOs of various companies – a unique experience which very few bankers get the chance to have. In the year 1999, I was posted at the overseas centre at New York, where I was made in-charge of Trade Finance Dept. Working in the financial hub of the world was again a unique experience – it widened my perspective and knowledge in respect of various financial instruments available in the market. Another advantage of working in overseas office is that you get to have broader perspective of how the bank works, as one is associated in decisions making in all the functions of the bank. Upon repatriation, I became part of Project Team, which was responsible for selecting, finalising & implementing Core banking solution in the bank. Another unique opportunity came to me when I was posted in International Division at Corporate Office. 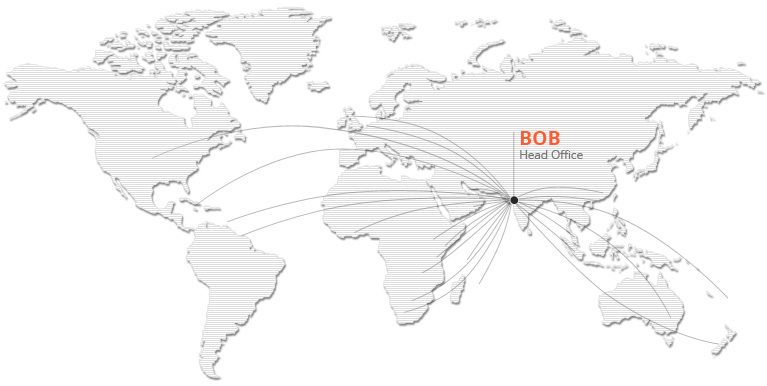 I was instrumental in opening of about 16 overseas offices. , In particular, I was proud of having orchestrated the opening of the Bahrain branch. I was instrumental in establishing that branch right from the beginning i.e. conducting feasibility study, visiting Bahrain and interacting with Dy. Governor of Central Bank for entry of our bank in their country and thereafter taking it to logical conclusion by establishing the branch. I am currently posted as Head of large branch in Mumbai. Here, my whole personality underwent change. As a leader, the perspective changed and I learnt how to lead self and others with an objective of increasing business. I look forward to having many more such enriching experiences in the times to come. I am a qualified Chartered Accountant and was aspiring for a career in the field of Banking/Finance. I had also work experience of over five years including over four years experience in the Junior Management grade in another Public Sector Bank prior to joining Bank of Baroda. This provided me a platform to aspire for a hi-flier job role in a big size reputed Bank like ours. My first three weeks in the Staff College, Ahmedabad helped me understand the strong culture of the Bank, wherein the talents are nurtured & shaped to face the real world. I was initially assigned the credit function of a large size urban branch, followed by further experience at various levels i.e. operational Banking at rural branch, credit function at specialized SSI branch and large branch, besides handling credit at further higher Zonal level. Thereafter, the Bank provided me with an exciting prestigious overseas assignment as Chief Financial Officer, which has further enriched me with important assignments like Funds Management, Treasury, Investments and Accounts/ Tax supervision and Balance Sheet finalization and planning function of the Bank at the corporate level. Our Bank was adjudged best Bank by Business India for the year 2010 & 2012. During my overseas posting at Zambia at our Joint Venture i.e. Indo Zambia Bank (IZB), in one of the meetings with the local eminent bankers and my local colleagues, I spoke about this achievement. Our local colleague commented that this strong backing of Indian Shareholders is reflected in the sound performance of IZB, in a market which has seen fall of some major Banks in mid 1990s. Thus this achievement of my bank in the domestic market is also boosting our image in the international market and I really feel proud of being a part to this great institution. Presently on repatriation back to India, I am entrusted with another important assignment of heading a Mid Corporate branch, which is a relative new vertical in the Bank. When I look back at my career, it is wonder how swiftly the Bank has groomed me for undertaking various responsibilities, without ever letting me feel unable to cope with the challenges. The Bank recognizes that this being service industry, the human capital is key factor for driving the organization growth. Thus the bank while identifying me for various important assignments has also taken care of professional input needs & has provided me the necessary skill imparting exercise through trainings at various levels. I was born and brought up in a rural background in Orissa which tremendously helped me in understanding the social fabric of India. In the midst of my postgraduate examination, I got appointment letter from Bank of Baroda and I joined on 24th January,1979. I joined a Bokaro Steel City Branch in Bihar. From there, I moved to various places - Berhampur, Keonjhar Branch as Branch Head, the Regional Office Credit Department, the Staff College as a faculty member, Georgetown Guyana on overseas assignment, Operations and Services Department at Head Office, Atmajyoti Ashram Road branch as Branch Head and then to Bhubaneswar. On elevation to AGM, I was posted as Regional Head Patna, and then Regional Head, Orissa. On promotion to Scale-VI, I moved to Rajkot and am presently at Ahmedabad City Region as Regional Head. I recall how during my probation period I organized several campaigns at my Branch. During one such campaign, I had opened a new account for an Engineer who went on to become CEO of a large PSU. After nearly 27 years, he saw a letter signed by me and enquired through his secretary whether I was working at Bokaro Steel City. On being told ‘Yes’, I was immediately called to his office. This relationship helpedme in establishing a very rewarding and profitable long term relationship for the Bank. The Bank has contributed immensely towards my personal growth during the last 33 years. Starting from my probation period, I have enjoyed the freedom and support for enhancing my skills. I have been nominated to a number of training programmes at reputed institutes both in India and abroad which have helped me become what I am today. I did my Post-graduation in Genetic and Plant Breeding from University of Agricultural Sciences, Bangalore. After working for six months in Agriculture Department of Karnataka State Government, I was planning to join for a Ph.D in the University, but dropped the idea when I got the offer from Bank of Baroda to join as a DRO. I was fortunate to get the opportunity to work as an Agriculture Officer, Lead Bank Officer, Branch Head of Rural, Industrial Estate, Metro branches, Retail Loan Factory and SME Loan Factory. Bank gave challenging assignments at regular intervals. I was the first to launch “Service Area Credit Plan” in the country for Ahwa Dangs District in Gujarat. I was also the first to start 8.00 am – 8.00 pm branch in Delhi. I started a Retail Loan factory in Delhi when there was a fierce competition from Private Sector Banks – this was a novel initiative across Public Sector Banks. 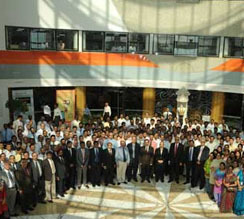 I was subsequently given a very ambitious project of starting the First National Pilot on SME in Pune. The SME Loan factory model was made very successful and then it was rolled out at various parts of the country. This has been my proudest moment in the bank, as I delivered when the bank gave me additional responsibility in recognition of my capacities and commitment. During my tenure in Tanzania as Managing Director of Bank of Baroda (Tanzania) Limited, I launched “Baroda Shule Account” for school children which was lauded as a big social protection scheme for children. Later on, many banks adopted similar schemes. I successfully started TUFs Cell in SMELF, Surat, and quickly converted the opportunity given to Textile Industries into Business. With the help of this, the bank mobilized the lion’s share of the business under the Sector. During my posting in Tanzania, I climbed Mount Kilimanjaro, which is the tallest mountain in Africa and third highest in the world. Along with my son, I hoisted National Flag and Bank of Baroda Flag on the summit at 5681 meters. For this achievement I was listed in “Limca Book of Records”- indeed a proud moment for me. It is a proud moment I share with the bank. I believe employee Engagement is a great tool for business development. I actively pursued the policy of interacting with sub-staff, clerical staff, branch heads, executives - all in one forum, and making presentations about Positive Attitude, Team Work and Dreaming big for performance. My position in the Bank has given me social recognition and acceptance, which made me and my family proud. I could give a proper education to my children, and could purchase a house and a car with a Bank loan which gave security and satisfaction to the family. I am indeed proud to be a Barodian. Human Resource Management Department, Bank of Baroda conducts recruitment in various cadres after releasing detailed advertisement in Employment News and Bank’s website. Candidates selected under different recruitment projects are contacted by the Head / Zonal / Regional Offices of the Bank for completion of various formalities before/after issuing Appointment letters. It has come to our notice that fake appointment letters for the post of Clerks / Substaff, said to have been issued by Bank of Baroda, HRM Dept., are received by few candidates. It has also been noticed that fake recruitment notices are released in internet / news papers by some miscreants and are sending false emails purporting to be from “Recruitment Cell” of Bank of Baroda. Candidates should check details of recruitments in Employment News or from the Recruitment link in Bank’s website www.bankofbaroda.com. The roll numbers of successful candidates of various recruitments should also be checked from Bank’s website.